Every so often when I go to watch a video online, the video won't play or only plays part-way and then goes to a screen flickering screen which I can't recover from. These videos are all being played through Adobe Flash Player. The solution is to disable hardware acceleration. Users who have this problem generally have an issue with the graphics card being compatible with Flash Player causing video rendering hand-off to the graphics card to be mutilated when it gets returned. This hardware acceleration can come in really useful when Adobe Flash is trying to render complex data. In this case, the only solution to our green flickering screen problem is to disable hardware acceleration. 1. Right-click the mouse over the video screen. 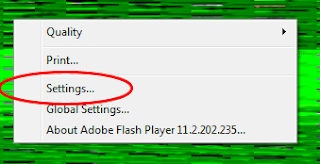 The Flash Player menu will appear and at the bottom you should see three menu items (Settings, Global Settings, and About Adobe Flash Player). 2. Select Settings. This will popup a small window with icon tabs at the bottom and a close button on the right. 3. Click the first tab (a computer screen icon with a play symbol). 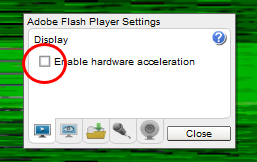 You should now have a checkbox that says "Enable Hardware Acceleration" next to it. 4. 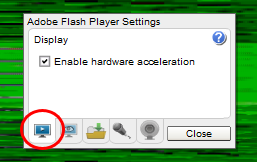 Deselect the checkbox for hardware acceleration. 5. Refresh the browser window containing the Flash movie.